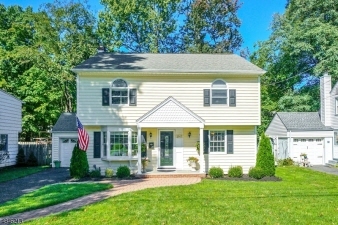 Description: Welcome home to this updated and meticulously maintained colonial, nestled on a quite street of the highly sought out Scotch Plains neighborhood. This home has great flow & spacious rooms throughout. - Newly refinished and gleaming hardwood floors, moldings, archways, updated eat-in kitchen with cherry cabinetry, granite counters and stainless steel appliances are just some features. Add'tl updates: New water heater (2017); Furnace (2014); New chimney liner (2017). The enclosed porch off first floor den leads to the fenced yard with deck AND patio. The roomy master bedroom has an enormous walk-in closet that is sure to impress. The recently renovated basement offers a rec room that completes this living space. Conveniently located close to all local schools, shopping, dining, NYC transit bus and major highways.